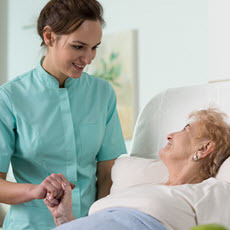 When it comes to managing the care of bed and chair-limited patients or loved ones, a primary concern for any care team will be preventing bedsores (or pressure ulcers). Not only does a prolonged amount of time spent lying or sitting in a bed increase the risk of developing a bedsore, but so do the debilitating chronic diseases which often confine people to beds in the first place. Bedsores form on the body where bony protrusions poke into vulnerable tissues - like on the tailbone, shoulder blades, hips, elbows, and heels. In constant contact with the surface of the bed, a patient’s body feels added pressure from these bony points, especially when the patient cannot move very much or stimulate blood flow and muscle contraction. Over time, a reddish discoloration will appear on the skin where a bedsore is developing. If the skin opens due to maceration or tearing, an ulcer will form that breaks down layers of skin and then subdermal tissue, potentially all the way down to the bone. These types of pressure ulcers can become infected if not treated, blood circulation can become cut off, and the internal tissues can actually start to die. The typical bed mattress is often composed of foam, springs, and cotton batting. Specialty mattresses, on the other hand, are engineered with better weight disbursement in mind and incorporate materials like memory foam, gel, and even air. Often used in hospitals and long-term care facilities, specialty mattresses help prevent bed sores by better disbursing a patient’s weight to relieve critical pressure points, as well as by increasing a patient’s blood circulation. An air mattress for hospital bed use, for example, might feature pockets or cells which fill with air and deflate based on custom settings set with the mechanical controls. As different parts of the mattress expand and decompress, it helps to shift a patient’s mass to keep them from lying on one part of their body for too long and to more evenly distribute their weight over extended periods of time. With similar effects of specialty mattresses, manual repositioning of a bed-limited patient can help prevent bed sores by keeping patients off susceptible pressure points when lying in bed. Studies show that repositioning a patient every 2 to 4 hours can have a positive effect in preventing pressure ulcers from developing, and it keeps that patient more comfortable. As an integral part of a bedsore prevention strategy, repositioning is typically done simply by shifting a patient’s weight from side to side with pillows placed under specific areas of their back and bottom. Pillows should also be placed under the legs to raise the heels of the feet off of the bed. Heels are prone to rub against the bed surface and overtime can develop serious pressure ulcers. Wound care management is its own medical field entirely, and dressing mid to late-stage bedsores requires medical training as well as specific dressings and wound supplies. When it comes to preventing bedsores, however, barrier creams are an accessible and effective tool any medical provider or caregiver can use. Barrier creams are topical aids comprised of ingredients which span the occlusive, emollient, and humectant categories (like zinc oxide, beeswax, and lanolin). They are applied to a healed or early stage bedsore and keep the skin nourished while repelling excess moisture and contaminants which can break down or irritate skin (like urine, feces, and sweat). Examples of barrier creams include Corona Cream and Extra Protective Cream (EPC). What you put inside the body can play just as important of a role as how you treat and handle the outside of the body when it comes to preventing bedsores. Proper nutrition to fuel tissue repair and reinforce skin can help fortify the body to protect itself against the development of pressure ulcers. Nutrients like protein, zinc, potassium, calcium, and vitamins C and E play particularly important roles in helping the body both repair damaged tissues as well as promote better blood circulation. Care networks should help patients consume lean meats, fresh fruits and vegetables (especially those with vitamin C like broccoli, bell peppers, and spinach, and those with potassium like acorn squash and avocado), as well as nuts, seeds, and calcium-rich dairy. In addition to diet modifications, barrier creams, mattress upgrades, and repositioning, bedsore prevention is most effective with keen and vigilant monitoring. Medical providers and caregivers can best keep bedsores from developing (or progressing) by taking daily scans of patients and loved ones to make note of any skin discolorations or areas of concern.